Miller was a one-time Wall Street reporter who also contributed to Sports Illustrated and Outdoor Life. His writing has all the precision of a financial reporter, but fortunately for us, it is combined with great charm, and Sparse could write on just about any subject under the sun and make it fun to read. 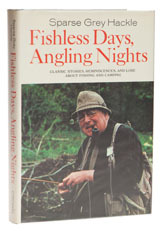 Fishless Days is best known for its extended memoir of Theodore Gordon and the Catskill flyfishers who knew him and the book was a key part of the cult that grew up around Gordon. Aside from this, there are some truly great tales to be read here and it is one of those books which should never have been allowed to go out of print. 'Murder' is probably the best known story in the book and it has been reprinted countless times in anthologies, but some of best cameos aren't even about fishing. My favourite bit of Miller's writing is in the chapter called 'Chance Meetings.' I've never been able to work out whether the passage is just came naturally to him, or whether he was just showing off what he could do with the words that the rest of us find so difficult to tame, but if you read the paragraphs about ‘the singers’, you will find out what I mean. So you really will have to get hold of a copy.